You’ll believe a mag can fly in BACK ISSUE #109, now shipping! Celebrate the 40th anniversary of SUPERMAN: THE MOVIE! 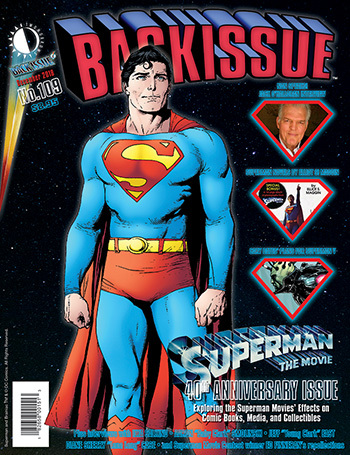 Back Issue #109 is now shipping, featuring: CARY BATES’ plans for unfilmed Superman V, ELLIOT S. MAGGIN’s Superman novels, plus interviews: ILYA SALKIND, JACK O’HALLORAN (Non), AARON SMOLINSKI (baby Clark), JEFF EAST (young Clark), DIANE SHERRY CASE (teenage Lana Lang), and a Chris Reeve Superman cover by GARY FRANK! This entry was posted in TNT on 9 November 2018 by Mr. Morrow.